St George’s Crypt, digital agency Blue Mantis and recovery and insolvency specialist Lewis BRI have all agreed terms at the 156,000 sq ft, five-storey office building. 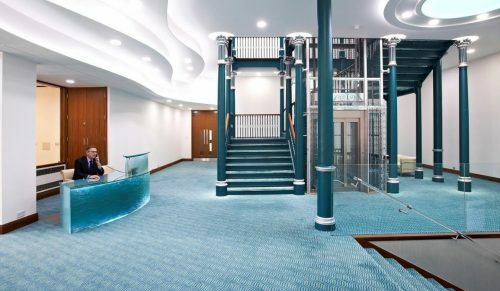 Originally built for Leeds clothing magnate and MP Sir John Barran, the Joseph’s Well has undergone a complete refurbishment by Leeds-based property company J Pullan & Sons, who moved their offices there last year. Francis McAllister of St George’s Crypt explained: “We are a charity based in the centre of Leeds – helping and supporting homeless people. Unfortunately the demand for our services is growing. Martyn Lee of Blue Mantis, which has expanded within Joseph’s Well, added: “We originally chose Joseph’s Well as the location for our growing digital agency due to a number of factors: Lots of natural light in the rooms, great access for our customers with on-site parking, affordable rents compared to other areas of Leeds city centre and a friendly and supportive management team. Joseph’s Well is located beside the Inner Ring Road in central Leeds. It is within a short walk of Leeds City Railway Station, City Square and all of the main retail and leisure amenities. Bruce Strachan, property director of Pullan’s, said: “These three new deals underline the continuing popularity of Joseph’s Well. Following the refurbishment, we have seen an increasing level of interest in Joseph’s Well resulting in new lettings. Our new tenants reflect the versatility and flexibility of space here, which is attracting a real breadth of occupiers. The joint marketing agents with Carter Towler for Joseph’s Well are the Leeds office of WSB.